When Dante arrived, Florence had come to a crossroads between the Middle Ages and the Renaissance. Dante helped lead the city into a new era. Ironically, though, this poet who embraced the Muses and exalted Florentine speech spent much of his life in exile. Only after Dante’s death did Florence want him back. Dante’s Italy was a tumultuous place. Kings and emperors battled with each other and the papacy, pitting church against government. Guilds and powerful families carved Florence into spheres of influence. Fortunes could be gained or lost overnight. Dante’s family, the Alighieri, was of noble origin but no longer wealthy. Still, Dante took immense pride in his ancestry. In Inferno XV, he claims descendence from the “holy seed” of the Romans who colonized Florence under Julius Caesar. When Dante was still a child, his mother died and his father remarried. Dante speaks affectionately of a sister in the Vita Nuova, but it is uncertain whether she was his full sister or a half sister. He also had three half-brothers. Like most educated men of his day, Dante studied grammar, logic, and rhetoric (the basic academic trivium, from which we get “trivia"), as well as arithmetic, music, geometry, and astronomy (the more advanced quadrivium). Boccaccio records that Dante also learned the arts of poetry, painting, and music. In the Vita Nuova, for example, Dante shows close familiarity with poems by Provencal (French), contemporary Italian, and classical authors. Before Dante turned 18, his father died. Prior to his death, however, he had arranged for Gemma Donati to be Dante’s wife. The couple had three or four children together. Although Dante includes numerous accounts of his contemporaries, friends, and enemies in the Divine Comedy, he says nothing of Gemma. Some commentators take this as a negative reflection on their relationship, but the memory might have been too painful. Ever afterward, Dante considered Beatrice the love of his life. He next met her nine years later, when he saw her on the street dressed in white and accompanied by two other girls. She greeted him sweetly by name, and he was enraptured. A short time later, having heard his name linked with someone else, Beatrice passed him without speaking, and Dante mourned for days. Dante and Beatrice never shared a love affair in any modern sense. Their meetings were no more intimate than passing in the street, and both of them married other people. Dante’s feelings for her fit into the tradition of courtly love, in which the woman was idealized and eternally out of reach. A physical relationship with her was neither possible nor desirable. Beatrice died when she was only 24, but Dante kept writing sonnets about her. Then, following a marvelous vision, Dante resolved “to write no more of this blessed one until I could do so more worthily.” He challenged himself “to compose concerning her what has never been written in rhyme of any woman.” The result was the Divine Comedy. In both the Comedy and the Vita Nuova, Dante’s love for Beatrice takes on supernatural attributes. She becomes a holy figure, comparable to the Virgin Mary. Beatrice comforts the poet, scolds him after he commits an unknown sin, and inspires him to write of his heavenly vision. Some consider her the symbol or embodiment of divine love. Dante’s life changed forever when he became involved in the war between two Florentine political parties, the White Guelfs and the Black Guelfs. The parties had originally split over a family squabble, but they came to represent the division between the tacky, new—money Cerchi family (Whites) and the classier, old—money Donati family (Blacks). Dante was unfortunate enough to be a White, married to a Black, ascending to political office—Florence’s priorate—just as conflict between the parties escalated into street warfare. When the Blacks overthrew the Whites in 1302, Dante was swept up in the party purge. He was accused of barratry (the sale of political office), fined 5,000 florins, and exiled for life. He spent the rest of his years boarding with various patrons and writing. 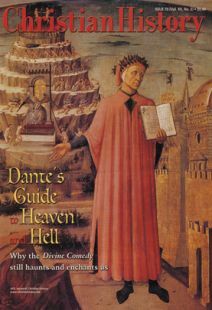 Though the Comedy is set in 1300, Dante wrote the entire work after he left Florence. Eventually Dante settled in Ravenna, where, writes Boccaccio, “he was honorably received by the lord of that city, who revived his fallen hopes with kindly encouragement, and, giving him abundantly such things as he needed, kept him there at his court for many years.” Dante’s sons Pietro and Jacopo and his daughter Beatrice came to live with him there. In the summer of 1321, while on a diplomatic mission to Venice, Dante became ill. When he returned to Ravenna, he lingered until fall, then died the night of September 13. Ravenna buried its adopted son with honors, rebuffing Florence’s request for the body. The city fathers believed Dante would not have wished to return. He had stated his opinion clearly in the full title of his masterwork: The Comedy of Dante Alighieri, Florentine by Citizenship, Not by Morals. Bonnie C. Harvey has written a number of nineteenth-century biographies including Fanny Crosby (Bethany House), Charles Finney (Barbour), and Daniel Webster (Enslow).